The Grades 3-5 students were blessed that Sr. Susan Wilkeem spent some time with them discussing the history of our Archdiocese. During the presentation she provided an overview of church structure and described the events that lead to the foundation of the new Archdiocese in 1915. 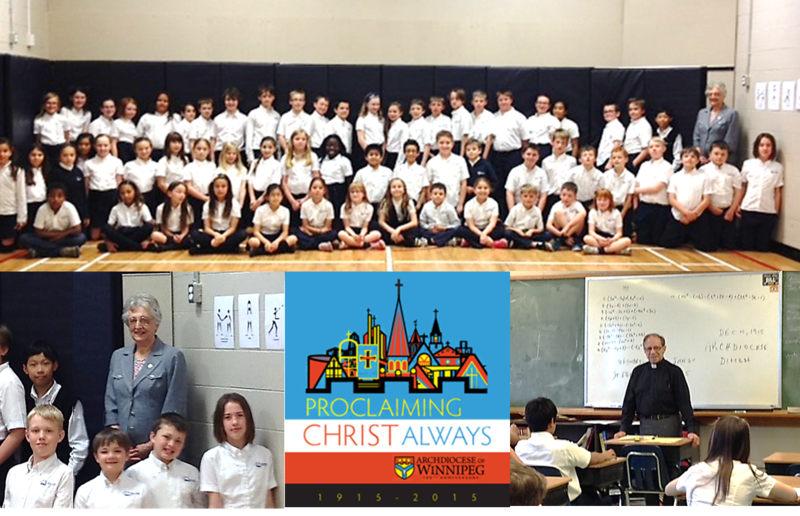 The Grades 6 and 7 students were equally blessed with a similar presentation by Msgr. Ward Jamieson, while the Grade 8 students were blessed with a presentation by Mr. Johnston Smith. In preparation for these sessions, the students were pleased to have had a preview PowerPoint presentation offered by our own Mrs. Narynski. These presentations have been a terrific learning experience for the students. Throughout, they have been encouraged to apply their knowledge of Canadian history in a personal context as members of the Archdiocese. Having recently attended the Anniversary Mass at the MTS Center, many of the students have shared their pride in being part of such a historical and vibrant Archdiocese! This entry was tagged 100 Years, Archdiocese, Proclaiming Christ Always, Winnipeg. Bookmark the permalink.